It’s that time again, when we document our latest foray into the world of charcuterie. This month’s challenge is “binding,” which involves using egg whites, gelatin or natural gel from bone stock to adhere ingredients together in a mold. The technique is used to make pâtés and terrines, which essentially are loaves of ground up or pureed meat cooked in a mold. Once again, this is not something we ever thought we would find ourselves making at home. But the satisfaction of learning new cooking techniques has been one of the best things about the Charcutepalooza experience. Thanks as always to the fearless leaders of Charcutepalooza, Mrs. Wheelbarrow and The Yummy Mummy, and an extra special thank you for offering a less sqeamish option for this month’s endeavor — seafood mousseline for the Apprentice level instead of “headcheese, feet or trotters” for the Charcutiere Challenge. As satisfying as it has been to take on these endeavors and cook outside our comfort zone, I really don’t think I could have handled a pig’s head or feet being cooked in my kitchen. And I really didn’t want to have to try tasting it. But that’s just me — I have great respect and admiration for those participants who took on the Charcutiere Challenge — well done! This month’s challenge meant that Dan got to purchase a new cooking “toy” — the terrine mold. This little receptacle is just the right size and shape, and comes with a ceramic piece that sits on top of the pâté as a nice base for whatever you’re using to weight it down at the end of the process. Making seafood mousseline is not particularly difficult. The challenging part of this challenge is to make it pretty. 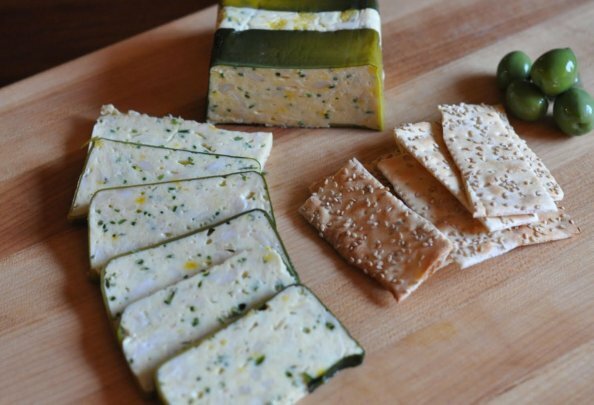 We followed Michael Ruhlman’s recipe in Charcuterie for “Maryland Crab, Scallop, and Saffron Terrine,” which not only sounds pretty, but looks pretty too, with ribbons of leek wrapped around the finished terrine like a present. A present made out of seafood. To make the leek ribbons, split several leek greens lengthwise and cook them in boiling salted water until they are tender — about 8 minutes. Then drain them, chill them in ice water and pat them dry. Line the terrine mold with plastic wrap, letting some of the wrap hang over the sides so it can be folded down over the mousseline. Then line the plastic in the mold with the leeks. Next, bring heavy cream to a boil, remove the pan from the heat and add the saffron. Allow the cream to sit for about 15 minutes, which will allow the saffron flavor to infuse the cream. Then chill the cream in the fridge. As with most charcuterie projects, it’s important to keep the ingredients cold at many points throughout the process. It is equally important to keep the equipment cold. We put all the food processor parts we would be using in the freezer for about an hour before we planned to use them. Combine scallops with egg whites in the food processor and puree until they are smooth. While the machine is running, slowly add the saffron cream. Season with salt and pepper. Ruhlman’s recipe calls for also seasoning with lemon juice, but we decided also to use lemon zest to add a little more lemon flavor and color to the finished product. In a separate bowl, combine the scallop mixture with chopped chives and lump crabmeat. Then fold over the leeks and the plastic wrap. I will admit I was highly skeptical about cooking the terrine with the plastic wrap in place — why wouldn’t the plastic melt into the seafood in a big gooey mess? I have no idea, but spoiler alert — it didn’t. Place the pan with the mold in the oven preheated to 300 degrees and bake until the internal temperature of the mousseline reaches 140 degrees. Ours took about 50 minutes. Remove the terrine mold from the water bath, take off the lid and place the ceramic base on top of the mousseline. Then weight it down as it cools with about 2 pounds worth of canned goods (or something else that weighs about 2 pounds and fits in the terrine mold.) After it cools from the oven, refrigerate the terrine overnight. the lemon zest is so pretty in there! charcuterie is witchcraft. Please stop. Nice description! I only made a veggie terrine and forgot to press it. Doh! Yours turned out beautifully!